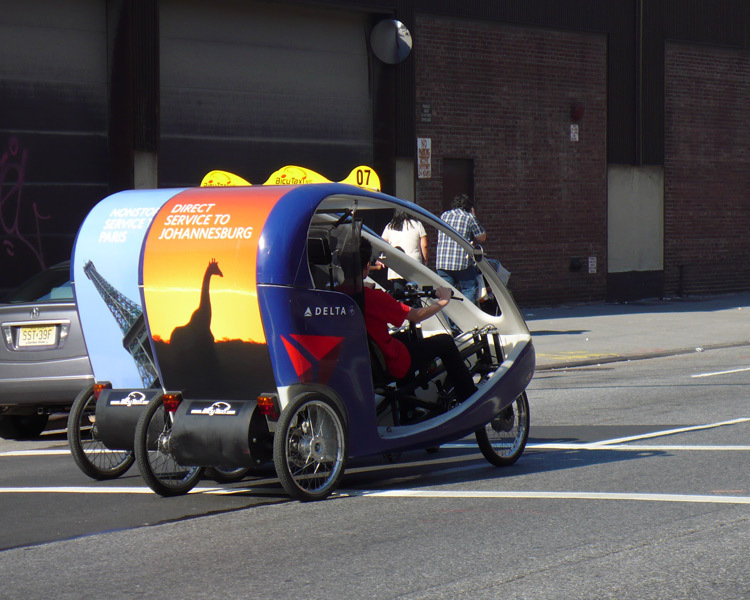 These bike taxis were spotted strolling down 10th avenue this Sunday around 3:00pm. Not only were they taking up an entire lane of traffic, but they didn't look remotely interested in taking on any fares. Admittedly they are better than the gas guzzling trucks which can be seen every so often driving up and down our city streets with a giant billboard in tow. But must we really subject ourselves to this? The sanctity of your Sunday afternoon should take precedence over and even defy your existence in commercial life. It is on these days of rest we attempt to find ourselves in our personal interests. Often that activity takes place in the public environment we all share as our common space. This intrusion is the same thing to a city dweller as an advertisement posted along a nature trail would be to a hiker. Just because it seems to fit into the current city environment doesnt make it any less out of place and in opposition to our desired use of the space we are traveling through.